Back in the day, LP covers were far more than merely a dust jacket for your music; they were a tangible, as well as sizeable purchase of artwork you could either skim over, or get lost in, depending on the artist’s efforts. As a young child sifting through my friend’s older brother’s LP collection, the music had nothing to do with an album cover. In fact, I’m not even sure I associated the two. It was the mid-to-late ‘70s, and we would marvel over, among others, the Molly Hatchet covers featuring work from Frank Frazetta, esteemed fantasy art illustrator. I’d love to say that these spooky covers were traumatic, but they weren’t. The slightly embarrassing admission I have is that it was the cover of Elton John‘s “Captain Fantastic and the Brown Dirt Cowboy” that had us both repeatedly awestruck, and then later for me, provided the fodder for nightmares. I’m sure it wasn’t Elton’s intention; (although maybe…) what is presented without a detailed breakdown is a fantastical Alice in Wonderland-type surreal hodgepodge illustration featuring mostly animal/human hybrids, bubbles, plants and music themes that spanned the entire front and back cover.…but now looking back at it, it really has much more of a Hieronymus Bosch flavor to it, a la the “Hell” panel from “The Garden of Earthly Delights.” I can’t pinpoint exactly what had me so unnerved, but there would be the Masked Ringleader in my dream, along with his minions of tendrilled human-birds, frogs with steps down their backs, and the little pellet-pooping cobble-pot wearing record-player dwarf, ready to wreak havoc on my psyche. My older sister had this album. I was use to my older brother having things that frightened me, but not my sister. I remember some weird character vomiting in his hand on that cover, but I can’t tell from the picture here. Even though the record cover disturbed me, much like the Kiss comic book I wrote about previously, I kept going back to look at it repeatedly. I love “Captain Fantastic,” both for the cover and music inside. I remember anticipating it for months and buying it right when it was released. In addition to the excellent album, you got a poster and a few handbooks. I have the poster framed on my living room wall. An album cover that creeped me out as a kid was Billy Joel’s “Piano Man”. His face is on the cover against a black background and it’s all white and ghost like! I don’t know if it was an overexposed print, airbrushed or shot on black and white infrared film but that image was a bit hard to look at! For an adult album cover trauma, anyone see that cover for Bjork’s “Selmasongs”? 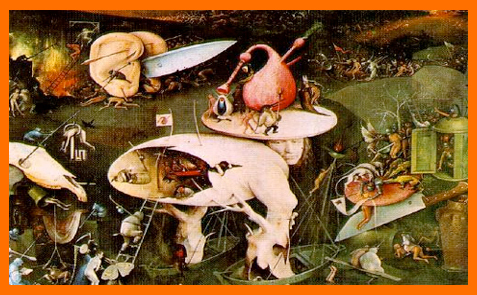 I have no memories associated with this album, but I do loves me some Bosch! 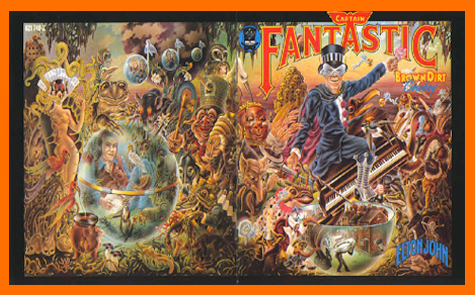 I have a strange desire to own a big poster of the Captain Fantastic album cover. It would look great in my cubicle at work. One of my favorite bands, Dead Can Dance, used the center portion of the triptych on their “Aion” album cover. Great blog – Capt. Fantastic remains one of my favorite albums from childhood! I miss the days of vinyl LP’s. So glad I grew up in that earlier age. Living in a world of CDs, downloads, and Ipods just isn’t the same. I remember this album cover freaking me out as well, along with the Molly Hatchet covers and “Wish You Were Here” by Floyd. I was around 4 when these came out and an older cousin had them all.